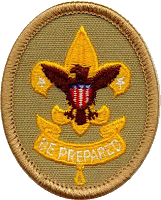 There is more to a campfire than just throwing a bunch of sticks and logs into the fire ring and letting them burn. 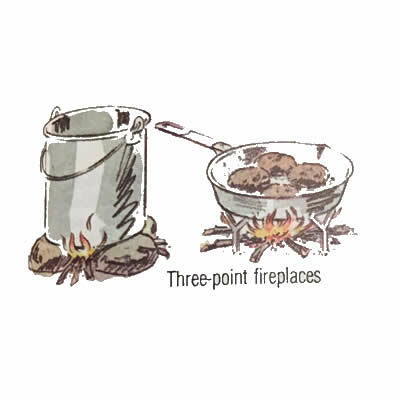 Yes, that method will sometimes produce a nice hot fire for you to huddle around during the cold night of your winter Klondike, but you can actually make your campfire work for you. Here are nine different types of fires that each serve a different purpose. Three-Point Fireplace. This is the simplest fireplace for a single pot or pan. Just place three rocks or even size around the fire lay. Or punch three metal tent pegs into the ground. Rock Fireplace. Choose dry, flat rocks. Set them in two rows close enough together to support you pots. Don’t use sandstone or wet rocks; they may explode when heated. Hunter’s Fireplace. 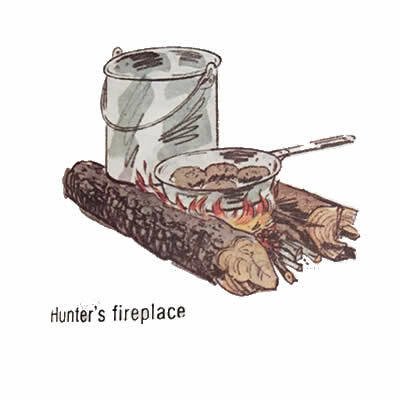 If you have logs, use them for a “hunter’s fire.” Place two of them close enough together to support your utensils. Since the fire eats up the logs from the inside, you will have to replace them from time to time. Bean Hole. 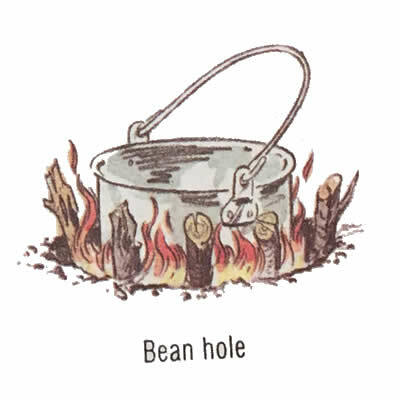 To cook bean-hole beans you need a hole in the ground large enough to hold a bean pot. Here, too, take care of turfs. Light a fire in the hole. Use the fire to cook the beans until they are soft. Then use the coals to bake them. Log-Cabin Fire. 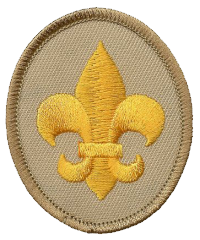 This is the ideal council fire for a whole camp of Scouts. 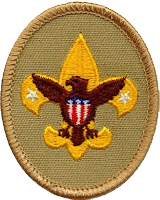 It consists of a crisscross fire lay made form logs, with a smaller crisscross fire lay made from branches on top. You light this upper fire lay. As the campfire program progresses, the fire eats its way down through the pile. 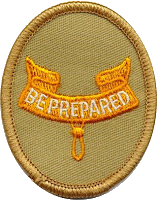 Reflector Fire. This fire is built against a reflector of logs or rocks. It provides comfort on a winter’s night. It is also good for baking or roasting in a reflector oven. Star Fire. You start this Indian fire with a tepee fire lay. You then place four or five logs around it like spokes in a wheel. You keep the burning end slightly raised on a stick. As the logs burn, you push them farther into the fire. Vigil Fire. 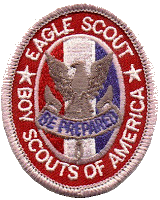 Roll two logs close to a tepee fire. Raise them off the ground on a couple of sticks for draft. Place a third log on top, also supported on a couple of draft sticks. The fire will burn for a couple of hours without being touched.